Industry in the UK constantly faces new rules, regulations and legislation requiring greater safety & more preventative measures to keep companies workforces heathy and safe. One of the main measure pushed is training and competency, however it can be an expensive and time consuming process to bring in staff trainers or send staff off to day courses. With the continually improving capabilities of the web and computers; training can be accomplished online with comprehensive video courses which implement question rounds culminating in a pass certificate. This method of training is both cost effective for the company and beneficial to the worker who can pause the course, return to it at a later date and replay sections until they can successfully complete each module to earn a completion certificate. All courses are ROSPA approved (The Royal Society for the Prevention of Accidents) and should be considered appropriate for those with some involvement with or who are in some way effected by the topics on these courses. These courses may not be appropriate for a company’s designated competent person; where deeper face to face training by a professional may be required. All courses can be ordered online by card or Paypal, or by other means by contacting us directly to open an account. Multiple licences can be ordered by the opening of a business account where singular licences can be distributed out by a central operator who can then keep an eye on the progress of participants. 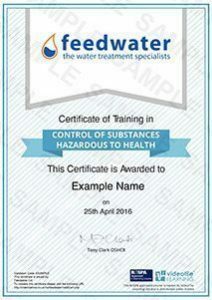 One licence is required per participant as certificates are generated upon completion. Discounts may be available for large orders, please contact us to discuss. PreviousPrevious post:Sulphite vs Tannin Oxygen Scavenger TreatmentsNextNext post:What should you test drinking water for?